Highly addictive fast paced game. 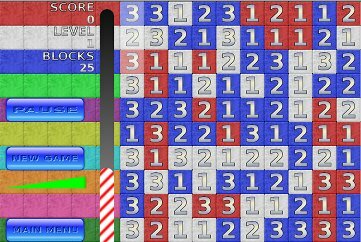 How to play: Simply click and drag the mouse to form rows of blocks that have matching color, matching numbers, or count up or down in order such as 1 2 3 or 3 2 1. You can also make color sequences such as red white and blue or blue white and red. See the in game help for visual examples. While playing you can see the order of the color sequences on the left side of the screen, the scoreboard background matches the order colors are added into the game and used for sequences. (Multiplayer server is currently offline) – Multiplayer over the internet, including both cooperative play and competitive player with up to 8 players in a room! Multiplayer games provide new challenges and allow you to compete with friends. Choose from three different game modes, 5×5 fury which is what it sounds, very fast paced, 7×7 mobile mode created for the best experience on android 2.2 phones, and the original 10×10 mode recommended for multiplayer games. Local high score list to track your performance, and you can post your scores on Facebook. You can use Facebook to invite your friends directly into a game you have created.